There are disciplines that prevail throughout time thanks to the persevering attitudes of select master artisans who are concerned because these detailed and time-consuming tasks are passed into history as true sources of knowledge. 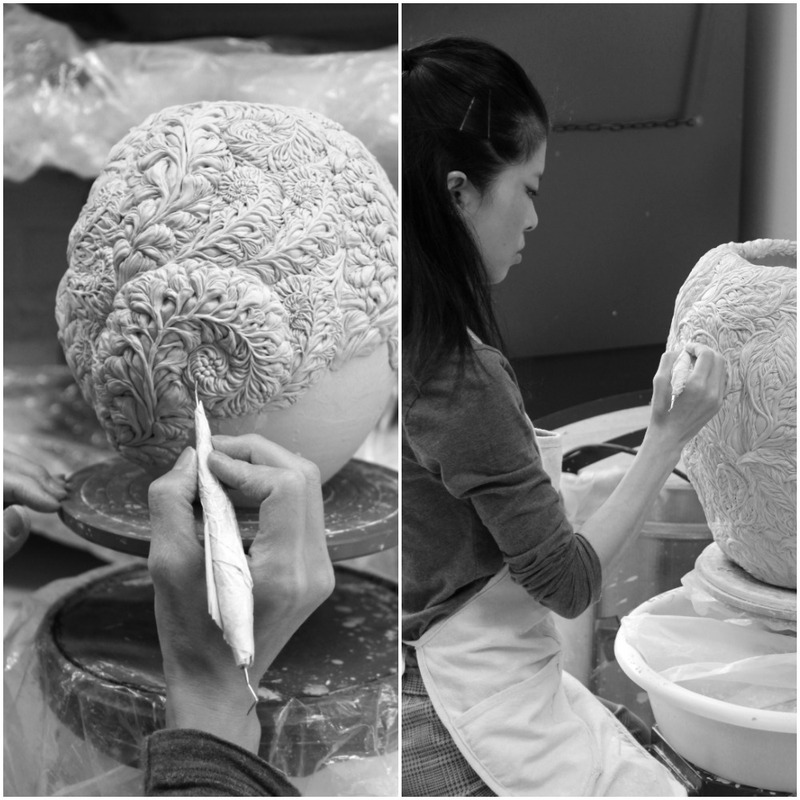 Thanks to this historic process, there are numerous works with us today made by prestigious masters of this specialty, such as those produced by the Wedgwood firm, now considered one of the greatest porcelain companies in the world. So, what does this have to do with the Japanese designer Hitomi Hosono? A great deal, especially after having collaborated with the prestigious British company, first as a guest and then commissioned by the brand to reinterpret, through her particular vision and personal aesthetic, some of the house’s most iconic pieces, specifically its Jasperware line developed by its creator Josiah Wedgwood in the mid-18th century. Hand made pieces from Hitomi Hosono designer. This kind of working coincidence occurs on very few occasions. What did this giant in ceramic production see in the work of the Japanese designer? Above all, a dedication and commitment to her unique work, which has led her to convert her meticulous and extraordinary production into highly valued and admired objects throughout the world. Her intricate detailing to achieve plant motifs and floral details of the natural world have become, thanks to her tools, museum works positioning her work as some of the best in today’s creative world. This collection for Wedgwood is composed of different vases, bowls and ornamental boxes in unglazed stoneware with a matte finish. Selection porcelain work from the designer. 1. 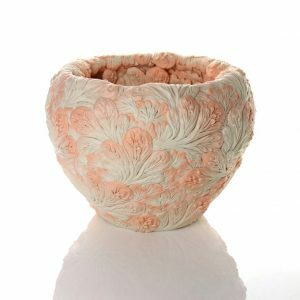 What does the ceramic work of Hitomi Hosono consist of and how did your relationship with this world begin? My experience with ceramics is based on Japanese and European traditions. I was born in Gifu prefecture, where pottery is historically one of their main industries and then, after coming to the UK, I studied Kutani ceramics (highly realistic with vivid colours) in the city of Kanazawa, in Ishikaw prefecture. 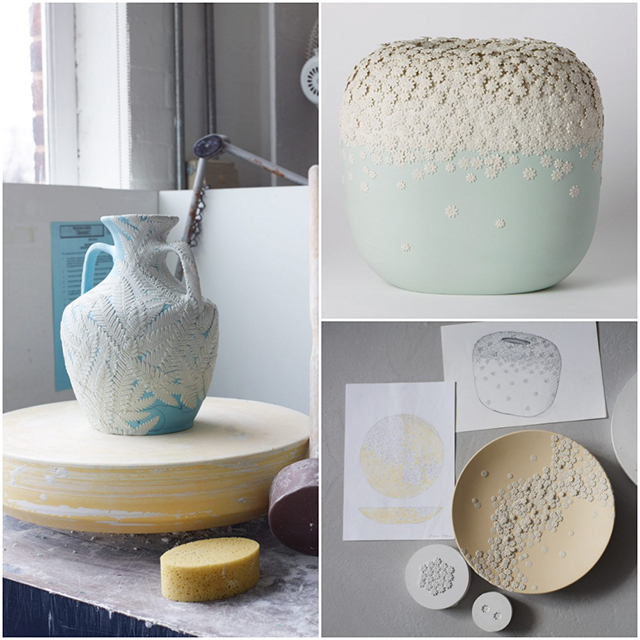 I later trained in ceramic product design in Copenhagen. 2. Your work essentially addresses the design of botanical elements, such as leaves or branches, by their parts. Why do you focus so much on this particular iconography? I’m totally fascinated by the forms of botany: the nervation of the leaves, the shapes of their edges and the stratification of petals on flowers. I usually get a lot of inspiration from the vegetation of London, where I find interesting plants: I like to touch them to feel and examine their structure and texture. I also like to study them in detail with a microscope. 3. Should we be looking for a special message in your kind of work? I’m very interested in finding the essence of what makes leaves and flowers beautiful. 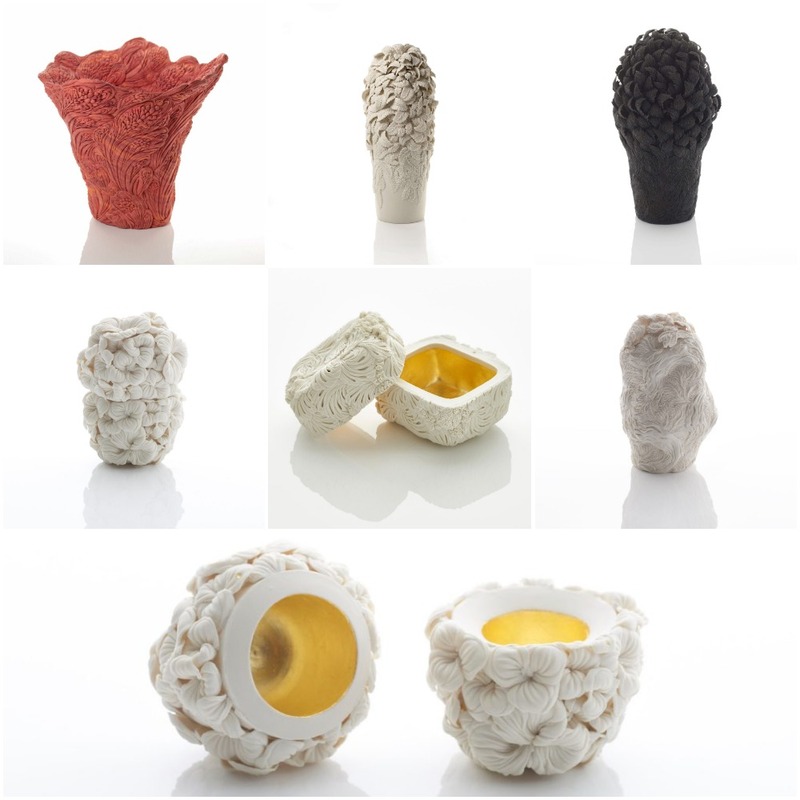 My intention is to translate and adapt the infinite beauty of nature to my sculptural porcelain pieces. 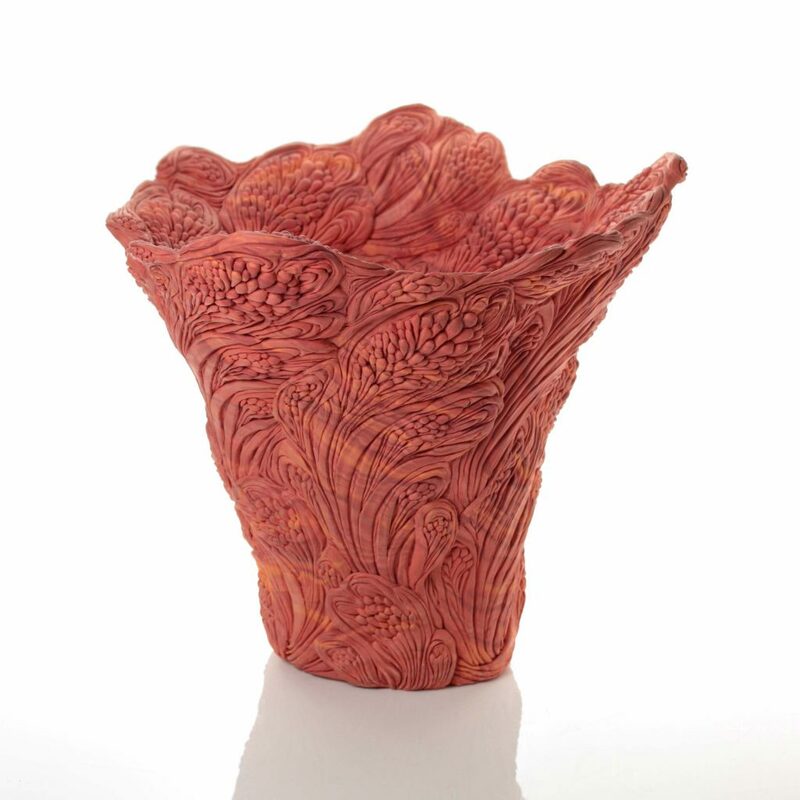 Vase made in coral color. Glass with colored exterior and interior appliqués. Container with details in salmon tone. 4. What is the most laborious part of this detailed working method? Carefully and patiently engraving in porcelain the tiniest details of hundreds of twigs. It is the most time consuming, but it is also my favourite work process. Quality at the highest level is vital, along with the design. I make sure that every step is carefully planned, thought out and completed with great care. For me, porcelain is also the best material to get organic forms. The artist in his workshop. Hitomi works in her resident period in Wedgwood. 6. However, you do not use much colour in your work. Would you ever change this aesthetic aspect of your pieces? I like to focus on the appearance and form, which is why I work with the natural colour of porcelain. 7. What three words define your work? 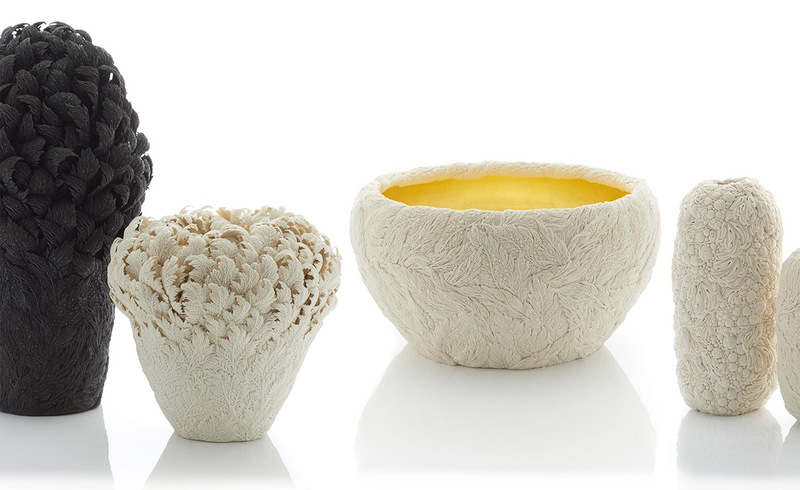 Delicacy and refined details, natural forms and fine porcelain. 8. How do you organise yourself when you’re starting a new piece? What I do first is an in-depth study of the organic forms that I’m going to work with. I analyse, feel and draw these dorms and then I make hundreds of branches of leaves in porcelain with moulds and carefully and patiently start sculpting the finer details. I then place the leaves on a surface, vase or bowl, which I’ve previously made on a potter’s wheel, and I cover it with the leaves in such a dense way that the underlying shape disappears completely. They are like the green leaves that obscure the branches of a tree. 9. And how much time can it take until the piece is completely finished? Well, apart from the drying time, from six months to a year. It is a process that also requires immense patience. 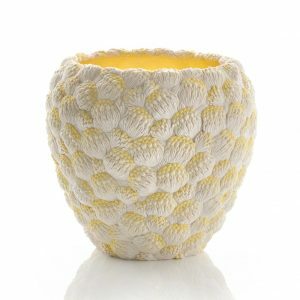 But well, I am a ceramics artist or ceramics or ceramist, and that’s what such a delicate and handmade job entails. Your hands are essential to achieve such a high-quality result. That’s the thing about artisan pieces, but although I don’t know what will happen in the future, I don’t believe it will be possible to do something similar with a machine any time soon.